Commemorate the Star Wars universe's return to order . . . The First Order! 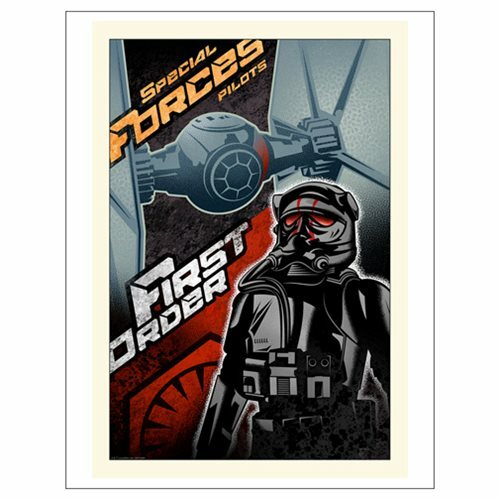 This Star Wars: The Force Awakens First Order Paper Giclee Print lets you celebrate the special forces TIE Fighter pilots of the Empire's new face. Painted by Mike Kungl in his signature style and featuring a First Order TIE Fighter Pilot standing in front of a TIE Fighter with the words, "Special Forces Pilots. First Order." Painted on paper, this beautiful giclee is a limited edition of 125 hand-numbered pieces. Measures 22-inches tall x 17-inches wide.